On Sunday 9th October a group from the Forum set out on the trail of two Victorian philanthropists from Tameside. The Refuge Assurance company was founded in 1858 by James Proctor and George Robins from Dukinfield, and its first office was George Robins house at 58 Astley Street. 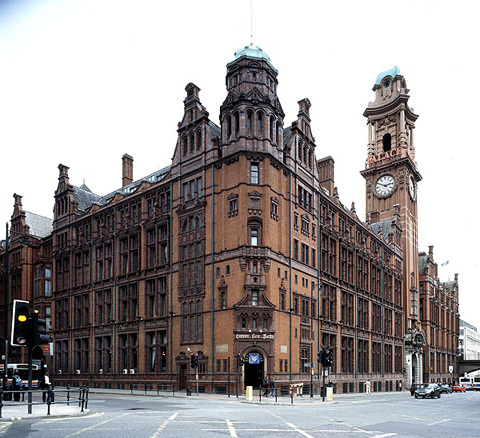 By 1895 the headquarters had moved to Manchester, and the Refuge Building at the junction of Oxford Road and Whitworth Street was opened. We spent an enjoyable afternoon there, viewing this Grade II listed building which has now been converted into the Palace hotel. Our guide was Barbara Frost, a Blue Badge tourist guide who specialises in the history of Manchester's hotels, and has written a book about them. In the case of this particular hotel she is able to offer even more insight as her first job on leaving school was for the Refuge, working in that very building. The building as it exists now is actually the result of three phases of construction, each by a different architect, but their skill and attention to detail ensures that each phase blends in to create a unity where the joins are almost invisible. The first architect was Alfred Waterhouse, and his scheme set the tone for the whole of the eventual complex. Some of this can be seen as soon as you walk in - his carefully chosen colour scheme, insistence on making the most of natural lighting, and choice of materials. The custom made ceramic tiles, terracotta, parquet flooring and stained glass have all survived over a century of everyday use and now contribute to the unique personality of what is now a very grand hotel. Alfred Waterhouse paid attention to the tiniest detail of his buildings. His colour scheme is based on restrained but warm tones; pinks, yellows and light browns, which appear in both the ceramics and the stained glass. This palette ensures that the chilly Manchester daylight is warmed up as it reaches rooms which were once open plan Victorian offices. We heard something of the history of the building and the company from Barbara as we sat in a cosy lounge which used to be the company's post room. Then our tour took in, among other areas, the basement ballroom (complete with theatre stage), the marble staircase, and a balcony from which details of the clock tower can be seen in close-up. We didn't climb the clock tower, although the stairs still exist, but until a few years ago someone had to climb it daily to wind the clock. The ballroom and theatre were part of the paternalistic ethos of the Refuge. It was one of the first employers to offer social benefits, and at one time the employees put on their own performances of Gilbert and Sullivan operettas there. The sprung dance floor is preserved, covered in carpet because the room is now used as the bigest conference facility in central Manchester. Barbara mentioned one of its intervening uses - to her it will always be the old staff restaurant, remembered from her very first job. Climbing the Carrara marble staircase, we thought we recognised some of the heraldic emblems in the stained glass windows as civic coats of arms - Ashton-under-Lyne, Manchester, Liverpool - and Barbara confirmed this. Each window is different, and features the arms of every place where the Refuge had an office. Extensions to the original building were carried out in 1912 and 1938. The third phase shows the transition from Art Nouveau to Art Deco styling, particularly in the use of stark white tiling. The colour here contrasts with the earlier phases, but the theme is carried through by the use of the same materials. The latest phase incorporated a penthouse flat occupied for two generations by members of the Taylor family who were the Refuge's resident engineers. Barbara's research has included visiting Alex Taylor, in retirement in Wales, to hear his memories of decades of living high above Whitworth Street, where the family actually created a rooftop garden. The recent renovation and conversion of the building has involved much subdividing of what were very large rooms to form over 250 bedrooms and suites. The hotel's owners are proud to own a building which is so much a part of Manchester's heritage, and the conversion shows off the original features to great effect. Even the corridors, usually a low point in hotel design, feature the sides of the tiled pillars at regular intervals, carefully displayed rather than covered over. For some of our group, the final touch was afternoon tea at the end of the tour. This was served in the elegant ground floor bar/lounge, a room full of architectural gems and history. The clerks who used to sit at rows of desk in this very room might well be surprised at its current use, but I rather think they would appreciate the care being taken to preserve this masterpiece of design and craftsmanship. Currently on display at Ashton Town Hall is a silver inkstand presented to Dukinfield at their Centenary by the Refuge Assurance to commemorate their origins at 58 Astley Street.